means, from the beginning of the settlement. Government Officials, Military Personnel, Free Settlers and Convicts. 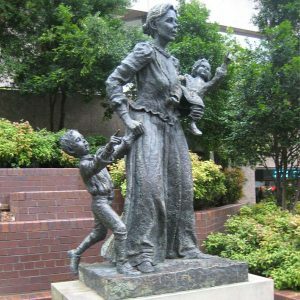 The Bicentennial Pioneer Woman Statue in the Jessie Street Gardens, Loftus Street, Circular Quay, Sydney. Women Pioneers and their vital role in the development of this wonderful country, Australia. It was unveiled by our then patron, Lady Rowland, on Saturday 19th November 1988.